Hip In Detroit: It's Dally Time! Ever since I was given a project to do on the Cass Corridor and along with it Dally in the Alley when I was going to College for Creative Studies, I have loved it. It's an awesome, big party. There are great bands, good food and lots of great art for sale, too! Theatre Bizarre even has a little area. 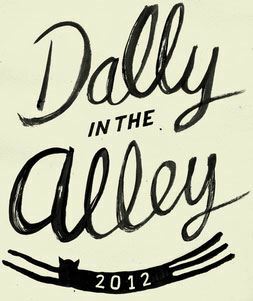 Dally in the Alley is going on today until 11 p.m. and admission is free! The whole thing is run by volunteers and the North Cass Community Union and they do it without aid of corporate sponsors! Talk about a do it yourself festival! The festival takes over the alleys (hence the name) in Cass Corridor and is a celebration of the historic and unique neighborhood. There are bands playing all day, and definitely some you want to check out. Lord Scrummage is playing at 6, The Summer Pledge at 7, Tunde Olaniran at 9 and Deastro at 10. You can go here to see the full lineup for the day. It's a beautiful day out today so you have no excuse to not head down to Detroit and have a blast at Dally in the Alley!